After a 23-year hiatus, the ARCA Racing Series presented by Menards returned to the tradition-rich Fairgrounds Speedway Nashville in 2015. By popular demand, it’s coming back in 2016 – April 8-9 for a stock car double-header featuring the 200-lap ARCA national tour finale Saturday night preceded by a combined ARCA/CRA Super Series-Southern Super Series late model clash to set the stage beginning Friday. Current ARCA Racing Series point leader John Wes Townley hopes to add his name to the impressive list of ARCA winners at Nashville, and he’s off to a great start. The Watkinsville, Ga., driver opened the season with a victory at Daytona Int’l Speedway, his second career win at Daytona. 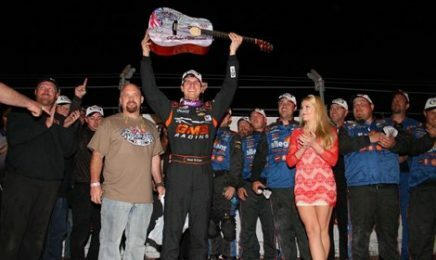 He’ll now look toward Nashville for what would be his career-first ARCA short track triumph. In addition to being one of those “iconic” tracks, Nashville builds champions, especially for those who steer their way into the winner’s circle on the seasoned five-eighths-mile banked oval. After Stacy’s ARCA win in ’59, other notable race winners/champions at Nashville include Jack Bowsher (ARCA champion), Don White (USAC Stock Car champion), Harold Smith (ARCA champion), Ramo Stott (ARCA champion), Moose Myers (ARCA champion), Marvin Smith (ARCA champion), David Green (NASCAR XFINITY champion) and most recently 2015 ARCA champion Grant Enfinger — who won last year’s ARCA 200. Other ARCA winners at Nashville include Andy Hampton, Red Farmer and Coo Coo Marlin, all of whom were track champions in their own locales. Nineteen-time ARCA winner Bob Schacht won three consecutive races at Nashville in 1981, ’82 and ’83.